Some of you may recognize this hack for what it is. This is the fourth and from the looks of it on the way to being the final version of tacthack. 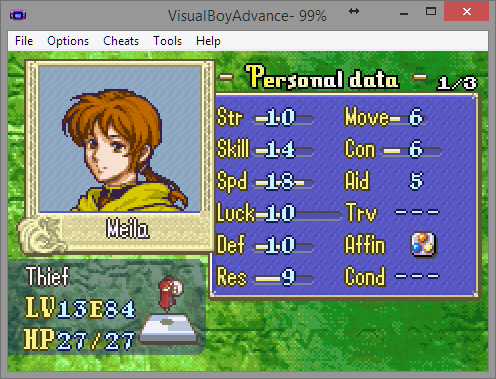 For those that don't know, Tacthack is a hack for FE7 with a playable tactician with an original setting and characters. Issues and rebalances galore later here's an update and the first release of the FINAL version of the hack. This version goes all the way through to the epilogue and rolls endings. Not all the endings are in mind you, as we are still writing supports to see what goes where but a majority of the Single endings are in. Dialogue for the final map has been added so if you beat it and have a save feel free to go back and view it. as far as changelogs go. 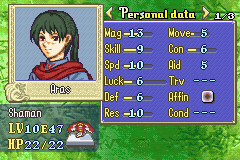 Aras recieved a slap on the wrist nerf but shes still strong. 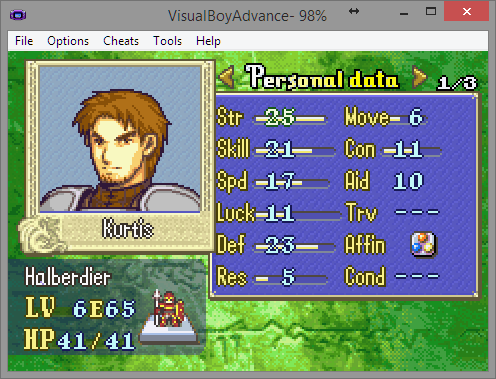 Gerwulfs statline and growths have been changed hopefully for the better this time. Brendan received a buff as did sven. Some late game bosses have received changes. It's been a fun ride and I'll keep polishing it but they'll be slower more paced out updates. 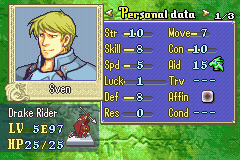 and a foreign tactician testing their knowledge of warfare on the battlefield. The two set out together to the continent of Fadrel for fame and fortune. not only their future, but the fate of many others as well. 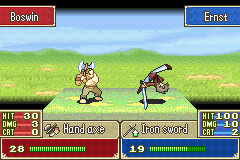 Wyverns use axes. gain lances on promotion. Cavaliers are split into Light and Heavy cavalry. Light cavalry are the traditional cav, using lances and swords and promote into paladins. Heavy cavalry use swords and axes and promote into great knights. Knights get bows! Retain axe gain on promotion. Weapon balance changed, bows are really scary now. Custom animations both original and from the community. 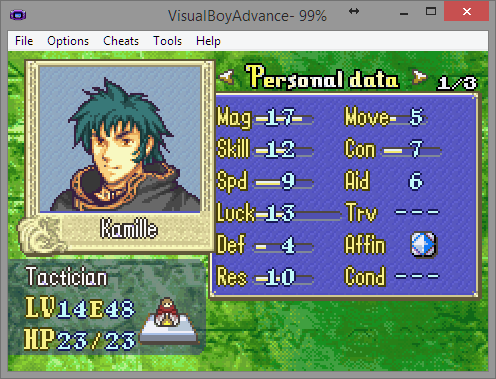 And since this is tact hack I encourage you to try making and using your own portrait and palette for the tactician character! instructions on how to switch them out below. All you'll need to insert these is a copy of feditor and HxD (or your hex editor of choice). 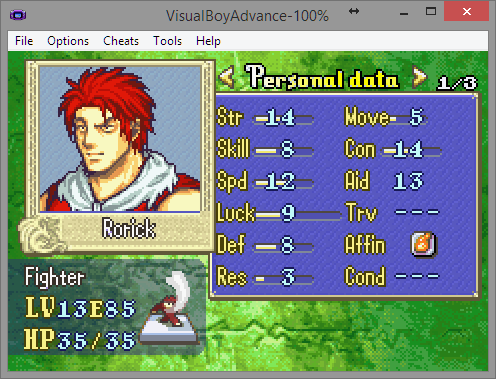 To insert the portraits open the rom with feditor go to the portrait editor and then go to the index of the corresponding tactician. Once there just load the portrait, apply, save the rom and your set. For the battle palettes open the rom in your hex editor, copy the palette hex listed here and paste overwrite the current version(ctrl+b in HxD.) and save. Then you'll be ready to play the game with your choice of tactician. An important note, for some reason the rom will lock in the Chapter 13 endscene on every emulator that I know of besides VBAM. We tried figuring it out but no luck. 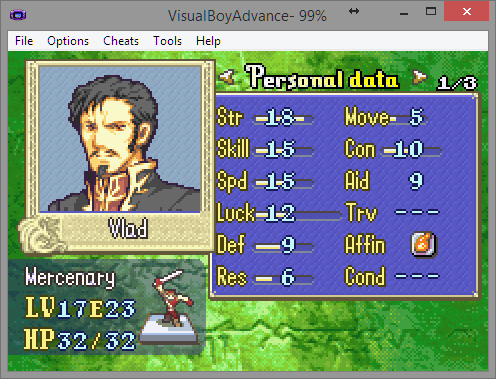 So if you do want to play or are in the middle of playing, use or switch over to VBA if you can/haven't already. Leave feedback on story, characters, maps units anything! Find any bugs? Post em! 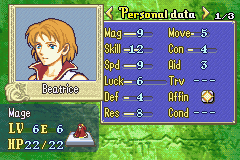 Make your own tacticians for people to use or just show them off. Vote in the poll for your favorite character, as a combatant or otherwise. I think I saw someone lp this and I've been wanting to play it since it looks really awesome ! A new hack for me to kill time eh? Looks good enough. 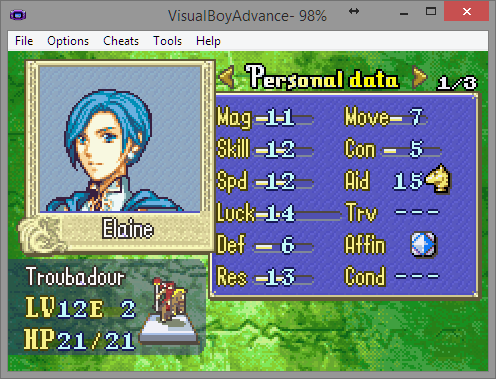 Is this hack for for FE7 or FE8? I remember loving the last version of this hack. I can't wait to give this new version a shot. Will definitely try this out when I have the time. Oshit! 14 chapters? siiiick. I'll def try this out. Hello there, really good hack so far. I'm expecting to play the next part soon. Of course there is some stuff I saw during the game, merely little things. 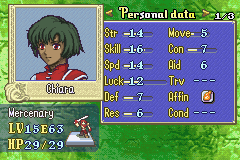 - Chiara's sprite is good when she is a player unit... while being a enemy unit though, she looks like she went on a killing spree before getting in its position. Nothing that could cause any problems, just looks kind of silly. Shoulda waited to see other things before making the last comment. Oh well. 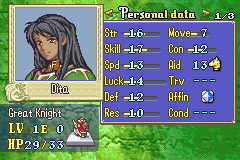 - Dita Great Knight base stats stay at 20. 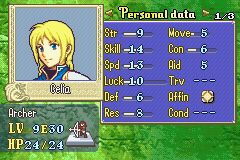 Also, why she gets the +5 con when promoted, but Gerwulf stays at +2? - Aras when promoted doesn't gain any stats and even loses -3 con. Thankfully, all that stuff you mentioned in the second post is fixed already. The other stuff is mainly I haven't gotten to it yet. 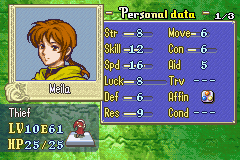 Since you've beaten the demo, any units or chapters that stand out to you? What it stood for me was the difficulty. It was kinda hard but not unfair. The last chapter in particular went as one in which I couldn't distract at any moment because of the reinforcements that kept coming. The chapter where the bishop went and destroyed the villages was also another one that stood out to me. Which reminds me that if you somehow rescue the Drake Lord girl from that chapter before she makes her escape, the scene when she runs still plays, which causes that when you check the unit that rescued her it will complety glitch out and lock the game. 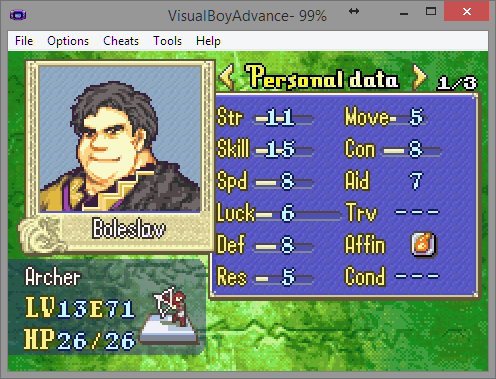 The characters that stood out the most for me where Wayland and Boleslav. 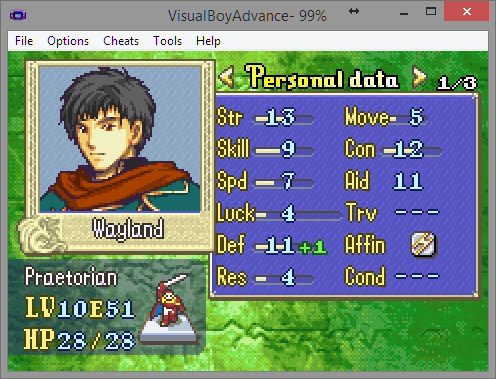 Wayland because of his promotion, which is pretty cool btw, and Boleslav because of his custom sprite, both as an Archer and a Sniper. Overall, as I metioned before, it was a really good hack. That still has things that could be better, probably, but the experience was as a whole satisfying. Of course the game it's still not over, so I'm looking forward to what's next. Who recruits Brendan? 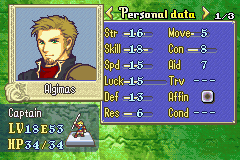 I tried with the two sensible characters (Algimas and Tact) but neither could talk to him and I couldn't be arsed to try everyone else. Not that he wouldn't have been benched. 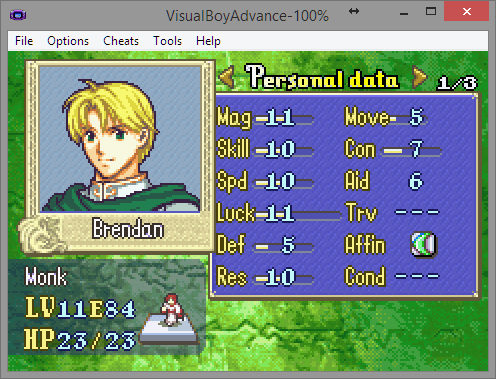 Brendan says who recruits him when he shows up and the same person is in the opening dialogue if they're alive. Just finished playing the demo. This was a hidden gem for me, and I definitely enjoyed it. I thought the sprites looked awesome, the story was really good and the balance needs a few touchups but overall good. So balance... it's really hard to tell with RNG. 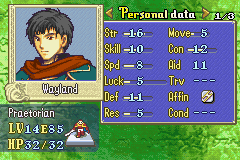 For me Wayland's defense was lacking quite a bit for a defensive unit, imo, and his promotion only gave him 1+ defense. 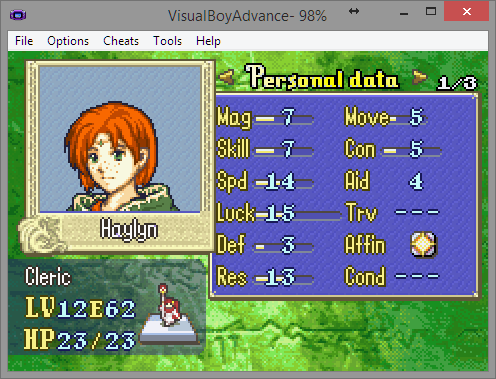 I also believe Haylyn gets way too much exp bonus from healing. 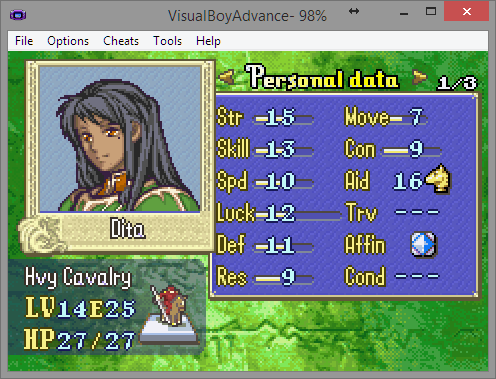 It was nice compared to the very low vanilla exp gain, but she was my first level 20 unit, by several chapters. 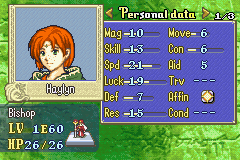 Elaine didn't level up nearly as fast as her, so I'm not sure if either it's healing in general, or if it's just Haylyn. Also lack of range weapons ( Javelin, etc ). None in shops really. Maybe that was your intention, idk, but definitely made things a bit more challenging. Character depth feels a little lacking without support conversations. Besides the main units who are heavily involved in the story, we really only get a brief introduction to develop a character. But eh the story isn't done yet and it can always wait till the final release or whatever, if you are planning to do supports anyways. 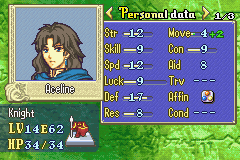 Fav units were the tact, Lani, Aceline, Celia, Wayland and Algimas. I really like the Wyvern Lord "heretic" girl too. 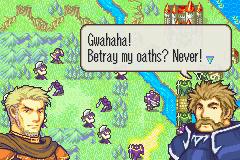 I also like how the tact is so involved in the story ( and playable ). Levels that stuck out were definitely the one where you had to save the villagers. Definitely couldn't waste any time in that one. I also destroyed the group of sages that were chasing me. I think I should've got a prize for that though =P. Ch14 was interesting too, but wasn't all that difficult. I'm a challenge junky, so more hoards the better imo, but not everyone likes every battle to be absolute hell like I do lol. I do think a few more enemy reinforcements popping up and going after the throne would make things wayyy more challenging, plus that is the goal of that battle ( protect throne ). Awesome work man, look forward to seeing more! 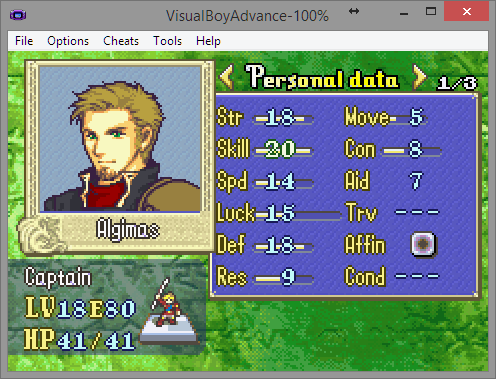 Why does the game hang at the end of Chapter 13 after Foskey and Algimas notice something? It's an emulator problem, download VBA and rename your save file to have the .sav extension. We aren't sure why it happens but it only hangs at that one scene in particular. Once you are past it it works fine but VBA seems to be the only thing that doesn't freak out there. Useful and well rounded. The lance rapier helped out against knights and the general bosses. Was very useful for the last mission, and managed to get the kill on the Bishop boss just before the sage train showed me a bad time. 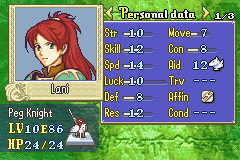 The first of many lance users you get, and the only one the you need to use. Used a Talisman for the last mission. Ended up mostly well rounded. Early game shaman breaks things a bit, and I had her at lvl 20 very early on. Later on helped with chip and Nosfera-tanking. The only offensive mage I used. Never ran out of tomes, perhaps due to stocking up on fluxes at the first shop. The first hero of the run. Soldiers are one of my favorite classes, so I used him as much as i could. My best tank and took out the final boss with a 1 Crit Ko. 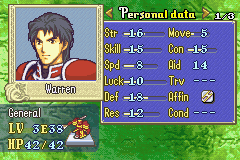 Lack of speed did hurt later on, and the excess of lance units almost made me drop him. Was given my other Talisman for the last mission. The second hero of the run. 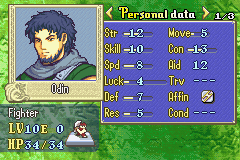 Berserkers are another favorite class of mine, so he was also used prolifically throughout the run. Him and Kurtis made a mad dash to the last boss. He was frighteningly frail later on, and was given 2 Dragonshields to compensate. 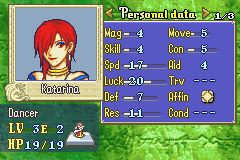 Bit of a glass cannon, and one of my main sword users throughout the game. 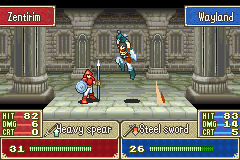 Enemy palette is broken. Didn't have too many competitors for sword usage, and stayed relevant throughout. Was given a Goddess Icon to help her relatively low survivability. Surprisingly strong thief. Helped get rid of axe users and dodge-tanked when needed. All around useful, especially when strength started coming in. Moderately useful for his side mission. When he came back he never was tanky enough to actually help, but wasn't bad enough to drop. Was a liability in the last chapter, where one of my resets was because he kept dying. Was always 1 strength away from killing mages, much to my chagrin. Can you say early-game healer? That magic is after an Energy Ring and promotion bonuses. Was surprisingly dodgy, and helped with healing throughout the game. Actually useful for the last chapter. Not much to say about him. 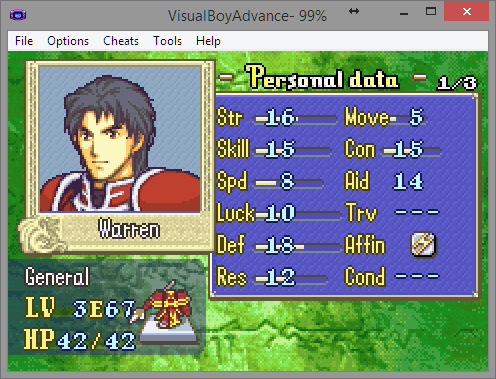 Good enough stats to one round some things, and take hits when he couldn't kill them. Second most useful out of the three you get in the last chapter. Another healer, but this one actually got magic! Frail throughout, and was given an Angelic Robe to compensate during the last chapter. Never got in a situation to use the extra safety, and tended to dodge most stray attacks. 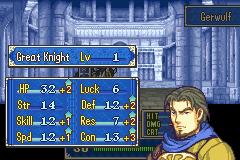 You give me a knight with 4 move during an escape mission?Another lance user given early on. Later on became increasingly useful, and after being given the Boots was actually able to move around. Surprisingly speedy, but I could've used some more strength at times. One of my main defenders of the right side during the final mission. Liked her scene when you recruit the two fighters with her (I didn't know she was small(?) before then.). 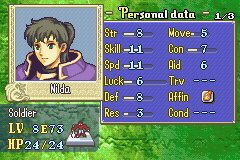 Used sparingly, until I realized she was statistically better than Gerwulf in almost every way. Helped with chip or finishing off a fighter or two during the final mission, but wasn't used for much. I've never been a fan of mounted units, and that hasn't changed. 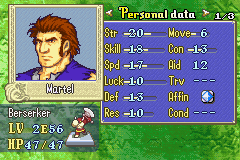 Speaking of Gerwulf. Tanky enough to help out early game, but just couldn't get the hits in later on. 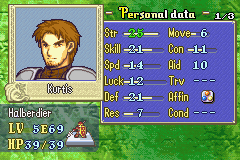 That six speed hurts when you don't have as much strength as Kurtis. The most useful of the three final units. Tanky and could one-round most knights, which most units has trouble doing. Was essential to the right side's defense. 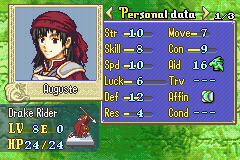 Happy to see pegasi getting the CON buff they so sorely deserved, but couldn't use her for much due to already having 3 lances on the team when she showed up (Algimas, Aceline, and Kurtis). Ferried Kurtis up to the Bishop boss, where he was promptly put to sleep. 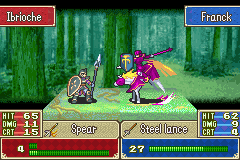 Kurtis put her short spear to good use, though. Shaman when I already have the Tactician, who was already at lvl 20 and wrecking faces. 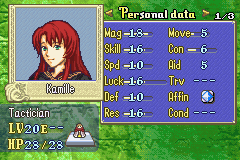 Gave her Nosferatu to Kamille and her Robe to Elaine and then sat on the bench. Never liked warriors, and fighters by extension. Already had Martel. Bench. Might as well just copy and paste what I said for Odin. Had one of my favorite scenes in the hack, and reminded me somewhat of Lennie from Of Mice and Men. 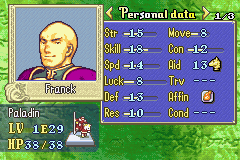 I would've used him if given earlier on, or if there were more deployment slots, just because I enjoyed his personality. 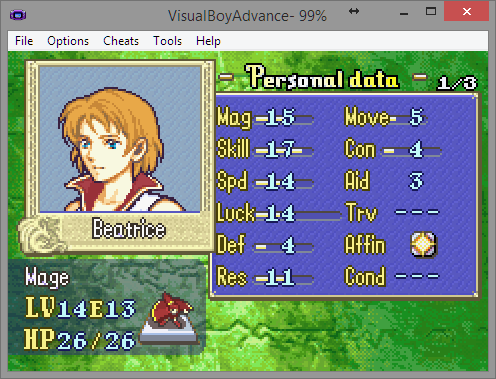 I love sages, but I already had a magic user in the Tactician to hit res. Used for the chapter she came in on and benched after. 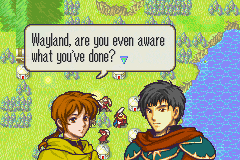 I see a lvl 10 Myrm on the second chapter, I think jeigan. Used until I got a new sword user, then benched. 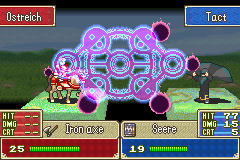 Probably ended up regretting that when axe users started to hurt later on. Used for a chapter or two, then benched. 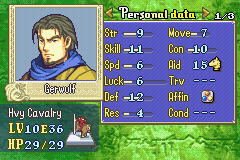 Don't like mounted units, and Gerwulf outperformed. Didn't need more lances either. 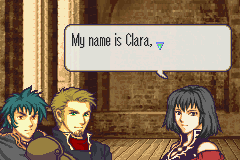 Was a huge liability in Chiara's chapter, and caused me my first reset. Second thief. 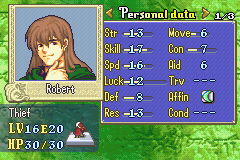 Robert was on a strength streak when she came along in the main story. Used for the side chapter, then she gave her light brand to Chiara and ran to the bench. 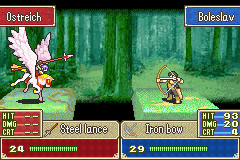 I like archers, but not enough to use two on a team, especially when knights can use bows as well. Gave her stuff to Santa ClauseBoleslav and ran to the bench. Wasn't even used for the monk's recruitment. Second knight. Same problem that Celia has, just along with the fact that I had more than enough lances when he came along. 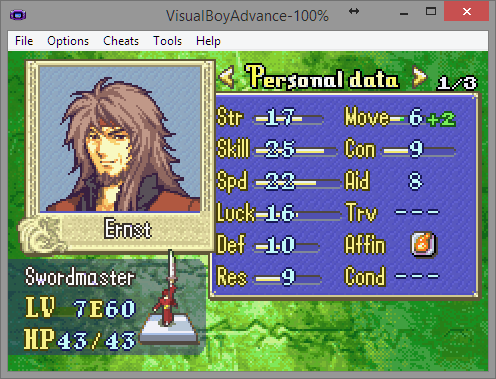 Same thing as Ernst. High level for the chapter makes me think they're a jeigan in disguise. 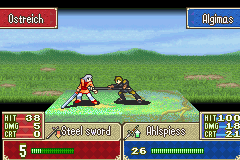 Chiara was already swinging swords around with Gerwulf so axes weren't that much of a problem at the time, so he was benched. Useless. Could get easily one-rounded on the very first turn if you didn't use the other two she came with to clear everything away. From there she hid on the throne and was forgotten. Easily the least useful of the entire cast. At least the people I didn't use had weapons that were unique enough to give to the others. Dancer. Came in extremely underleveled, but with a very high speed and luck to compensate. Useful for refreshing certain units to help clear out the right side of the final mission. Took me about 2 days to finish. Main problem was just how many units you get compared to how many deployment slots you had. By the end I was tempted to forego the extra people because the extras simply didn't have the training my main team had. Time to grind to 20/20 to see how wrong I was about who was useful and what-not! Great hack overall; I like the story and how the characters have their own personalities. Looking forward to the next installment. Pretty solid throughout. I gave him most of the stat boosters throughout the game. 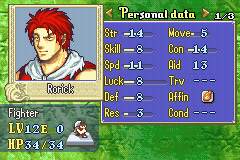 It feels like he levels a lot slower compared to other characters. A little below average. 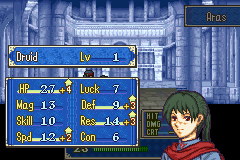 Good MAG means lots of damage, but low SPD means he almost never doubles. 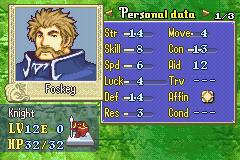 Good Oifey, and my favorite character in the game. 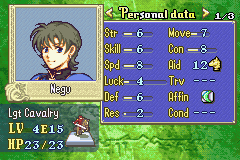 He destroyed those dark mages in the forest chapter with the Light Sword. Fed him boss kills. IS HE SUPPOSED TO BE THIS OP?! Because he's OP. I even promoted him two levels early. Good mage, but fragile. Consistently doubled things. 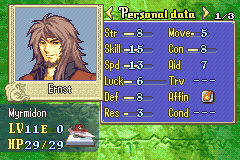 A stronger but less durable version of Ernst. A bit of a glass cannon. 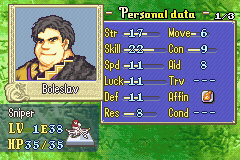 I immediately dumped Boleslav when I got her. 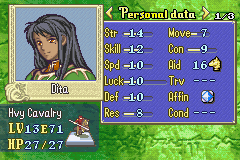 She's like a combination of a myrmidon and an archer. Other healer. I deployed both of them together. Why are thieves in this game so good at combat? I chose him out of the two Fighters, but didn't use him too much. Not my favorite class. Decent relief unit. Not enough HP to be viable. Solid unit for the chapter he joins. Tanks stuff well. 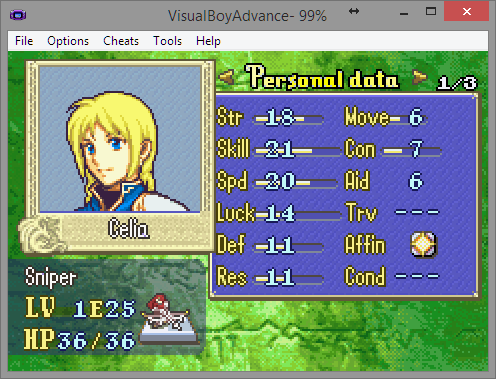 He was useful at the beginning as the only Archer, but he got way outclassed by Celia. 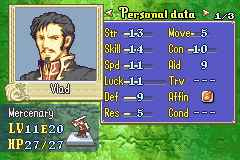 By the time he joined the main force, his SPD was too low and he was behind on levels. Didn't use him as a result. Used him sparingly as a backup. Also, Blaggi is that you? Alright so I was able to play up to chapter 13 and then once I finished the chapter the screen goes to black and the game completely shuts off. Is there a way to fix this? 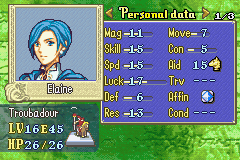 Hm, I've never tried out a FE hack. This one looks pretty promising, though. There's an event in that chapter that most emulators aside from VBA can't get through. Tact's seen trouble with Higan, MGBA, and MyBoy all at that spot. Install VBA, rename your save's file extension to .sav if it's not already, and you should be able to get past that just fine. I use OpenEmu but when I tried VBA, the emulator couldn't even open the rom. It just crashed. Could you send me your save file? Just want to make sure it works and if it does I'll send it back.